The opening of the mosque in Ipswich on Friday 13th of March was naturally a special occasion for the local community when it drew guests from all faiths and communities. 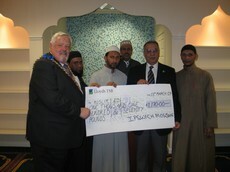 But the occasion became yet more special when the Mayor of Ipswich, Councillor David Hale, presented a cheque of £1170.00 to Muslim Aid for its relief work in Gaza. Accepting the cheque, Muslim Aid Community Liaison Officer M.W Khokhar expressed the charity’s appreciation and thanks to the Ipswich Mosque community and its leadership, Chairman Mr Tune Miah, Barrister Rizwan, trustee Mahbub Alam Shamim and the Imam, Maulana Hafiz Yusuf Saleh for their kind support in the aid of the beleaguered children of Gaza. Muslim Aid will use these funds for its ongoing rehabilitation projects in the Gaza Strip, including the Palestine Trauma Centre. The Centre is providing much needed counselling to over 84,000 children traumatised by the recent aerial and ground invasion of the territory.